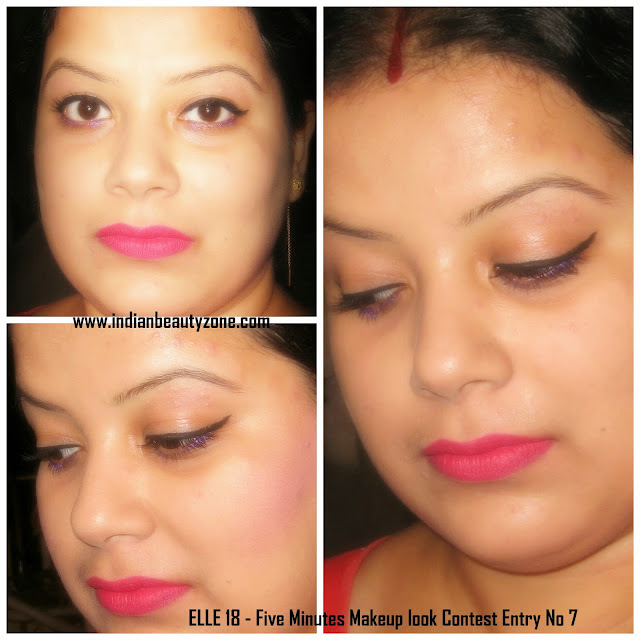 Colorbar bb cream, Rimmel stay matte face powder, Maybelline colossal kajal, Lakme liquid eyeliner in black, Lakme eyeconic mascara and Faces ultimate pro lipstick in shade “read my lips”. I use to do this makeup for daily basis hope you all like my pictures. My morning makeup takes exactly not more than 5 minutes. Hence college friendly. I follow these steps after following my Cleansing, Toning, Moisturizing routine. STEP 2: Line upper lashline and lower waterline with a long stay kohl. Apply mascara. STEP 3: Apply a very neutral pink blush. STEP 4: Apply gloss to the lips. I wear lipgloss that matches my dress. That's it and you are set to go. Hope you all like my simple yet fresh makeup tutorial. Do give it a try. It is a time saver. Samannita you are looking so pretty, you know you don't look married at all, loved your 5 minute makeup look. OMG, who's this doll in the second pic, is this my sweety Swati? You are looking so cute and gorgeous dear, loved your look. U have such a pretty skin Sammannita. Nice look Chinky girl and Samannita! !